The Royal Institute for Cultural Heritage (KIK-IRPA) in Belgium wishes a wonderful Christmas time to all the fans of the Art Nouveau period and the Partage Plus project. The Partage Plus project was chosen from among the different projects hosted by the Royal Institute for Cultural Heritage to illustrate this year´s Christmas greeting cards. About 2000 copies of the greeting card will be printed very soon. 75 000 art nouveau objects (jewelry, posters, furniture, stained-glass windows, ceramics, architecture…) are digitized and made available on www.europeana.eu. Several thousand of these come from IRPA-KIK’s photo library (balat.kikirpa.be). 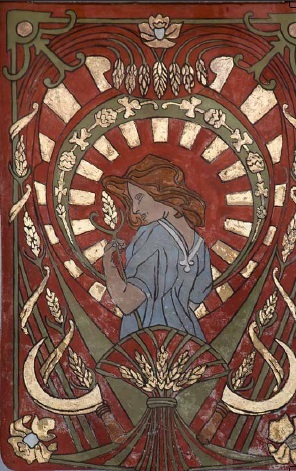 This theme will be explored further during the conference Art nouveau revisited: tendencies and peculiarities (IRPA-KIK, 13-14 February 2014).